My mother called me that morning and said “Turn on the news, they are blowing up those towers! Those towers in New York! Turn it on now!” I then owned a television, a 13-inch in the living room. Mom always woke early, but given the three-hour time difference between California and Cambridge, her call meant she’d not slept well, and she had too early turned on to the morning news. It was a little before 9:00 in Cambridge. I was in the hallway when the phone rang. I picked up the cordless sitting in a bookcase. With Mom on the phone, I walked to the living room and turned on CNN. Within a few minutes, we saw the second plane go in. Mom had talked about an impending terrorist attack for a few years, believed one was coming, and that morning she preached about what we saw together, 3,000 miles apart, and before any information was known. Terrorism. She knew it with the first plane, and she unconsciously knew that more than one tower would be hit, her use of “towers” when she called me was clairvoyance not simply sloppy speech habits. After we hung up, I stayed glued to the television the rest of the day, hypnotized by the unfolding that poured through 13 inches, a reality larger than any screen could hold. Classes started that week. I was numb, a stupor exacerbated by hypnotizing news scrolls, and cable television’s drama pandering. When I write “I was numb” to describe my stupor, this does not mean I mourned lost American innocence. We’ve never been innocent. Ignorant, yes. Innocent, no. In those days, I held an unpopular narrative: I believed that American imperialism dictated we had this coming. Wasn’t a professor somewhere fired for saying that? Our collective hubris, greed, and violence meant that karma waited patiently for us to change, to do better by others and the world. Even at Harvard, or perhaps especially at Harvard, calling out American hubris meant knowing your audience well. I rarely spoke so, because A-M-E-R-I-C-A. As socially awkward and defiant as I am, even I knew better than to speak this criticism to many, especially those in collective grief. America, a deity unto itself, the Great God who bears consumerism’s gifts, the safe salvation of dogma, and all wrapped in the comforts of white, capitalist Christianity. We still burn heretics in this country, but not with fire. We oust them from universities, or diminish their right to life, liberty, the pursuit of happiness by ostracizing them. At the very least. The great God of Christian American Exceptionalism must be serviced like a Golden Bull. I never understood, nor do I understand now, the need to fetishize the tragedies of 9/11. I’ve never understood the need to trot out this day every year, wear our victimhood like a shiny ornament, and decorate it in crying eagles, waving flags, and Jesus memes. This does not honor those who died, it validates the victim narrative of those who need their nationalism served rare with a hot side of Christian values, while stoking Islamophobia. Victimhood, a privilege. A source of extremism, with The Book beside. This victimhood has nothing to do with those who actually lost partners, parents, children, friends. I remember. And it’s possible to recognize one’s privileges, and still be stupefied when horror and fragility bombard you through 13 inches of televised narrative. Our shared existential fragility shone clear to me that day and in the weeks following, perhaps because I owned no blanket embroidered with Exceptional Eagles or Easy Christian Morals. I believe that life’s preciousness is not meant to breed fear or loathing. It’s a call to deeper living, and creates a drive to carve respect and understanding from ashes. Too many chose fear; many who lost more than they believed possible chose love. We refuse to look at what would most teach us. 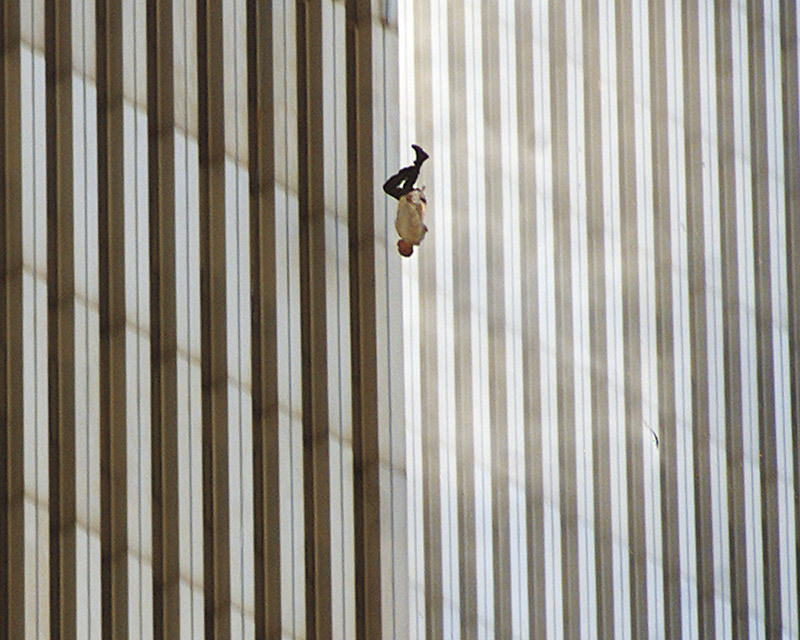 The falling man could hold us in his surrender to fragility as a powerful spiritual testament. But we refuse to look, and we refuse to see. If the terrorists hated us, it’s not because of our freedoms, it’s because U.S policies in the Middle East dictated by Saudi oil inevitably spawned a hatred born of poverty and ignorance. It takes little leadership to join fear and ignorance into violence, as we should rightly know. But we refuse to look, we refuse to see. Many years ago, I had a class at Harvard Divinity with James Lawson. A Methodist minister, after receiving his Ph.D., he went to India, trained on Gandhi’s ashram, came back to the states, and then accidentally met Dr. King in a coffee shop (a too easy summary). They talked, and King told Lawson he needed him in the movement. Lawson ended up leading King’s civil rights nonviolent resistance training. Perhaps that’s what we’re witnessing now with the horrifying drunk uncle sitting at America’s helm, this grotesque caricature of our worst selves televised and tweeting in our faces 24/7. At some point the addict must admit her addiction, must look in the mirror. Perhaps we’re dealing on deep levels with our privileged stupor, facing our collective functioning alcoholic in the drunk-uncle-in-chief’s face. But will we look? Will we finally see that we have arrived at our United States of The Lost Weekend? I don’t know if we’re at a defining crossroads. I doubt it. Change isn’t that easy, rarely comes in tidy packages. But the unmitigated violence of Screeching Eagles and white Christian racist misogyny cannot hold. Will we look, will we see? Like “Families For Peaceful Tomorrows,” will we remember better?